In this post, I will show you how you can easily fix your 404 error pages in WordPress using some free tools. WordPress is without a shadow of a doubt ‘the best’ website building tool. Would you agree? I simply could not imagine myself building websites using any other platform or CSS. Creating content in WordPress is one of my favorite things to do, especially now that we have plenty of tools and various apps to make our content look great. Yep, creating content in WordPress is pretty awesome, but what happens when you decide to remove content from your WordPress blog or website? Oh yes, that’s right, you automatically generate a nice evil looking “404 error page”. Now, if you have done this a few times in the past and as a result ended up with a website that is generating lots of 404 error pages, don’t panic! Today, I’m going to show you how to do something very simple but critical for fixing your 404 error page-not-found quickly. No one likes you Mr. 404 Error Page, so why do you even exist? That’s right, no one likes seeing 404 error pages. The first thing I do when I come across one I automatically hit the back button quickly. And if I happen to find one of these on my own website, I usually act quickly to try and fix it. What are 404 Error pages, anyway? So, if you’re totally new to all of this and don’t know what a dreaded 404 is or what it looks like, here goes. A 404 Error Page is a default message page, telling the user that the page they’re looking for on a website no longer exists. How are 404 Error pages generated? OK, so let’s say you have a lot of posts, pages, tags, categories, etc. 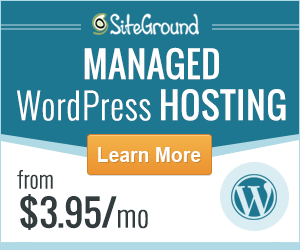 on your WordPress website. And let’s say a day comes along when you decide to delete a few of those pages, along with some unwanted tags, categories, and heck, maybe a few dozen blog posts in the process. 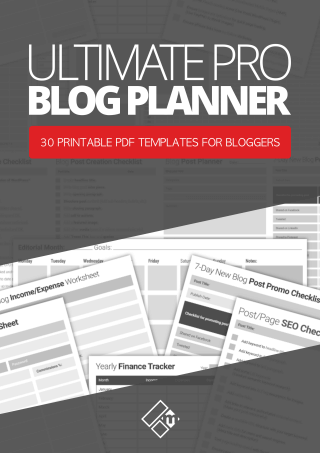 Now, you’re probably thinking, why would anyone want to delete content from their blog? If you’re doing a content audit, for example, and you’re wanting to remove posts that are no longer providing any value to your readers, you will want to delete some of them. Now, what happens when someone visits a page, post, category or tag that has been deleted? That’s right, they see a page with the message: 404 Error Page Not Found as I mentioned earlier. Because you removed/deleted that destination URL, therefore the page they’re looking for no longer exists, so instead your visitors will see a generated 404 error page like the one shown above. The big deal is that it affects user-experience. Anyone coming to that deleted page/destination on your website from whatever source will find a 404-error page waiting for them, and that makes for bad user experience. 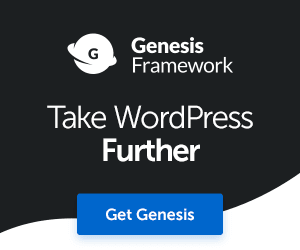 Just because you deleted the URL from your WordPress website, it doesn’t mean that no one will ever try to access it again. This is because you may or will have both internal and externa links pointing to the URL you removed, and that is now a generated 404 Error page. So, you’re saying that 404’s are bad for my website? No, they are not bad for your website, however, like I said, they can create a bad user experience for your visitors. Other reasons why a user might see a 404 error page not found on your website is, for example, if you’ve spelled the URL incorrectly in an internal or external source. Let’s say you’re writing a guest post and link to one of your posts on your own website and accidentally misspell the URL, without knowing it, you’re going to generate a 404 error page message. Making changes to your website’s permalink structure can also generate 404 error messages. OK, but what about search engines, will I get penalized by Google? There are some mixed debates about whether 404’s actually affect search engine rankings or not. Or, whether you might receive a penalty from Google for instance. 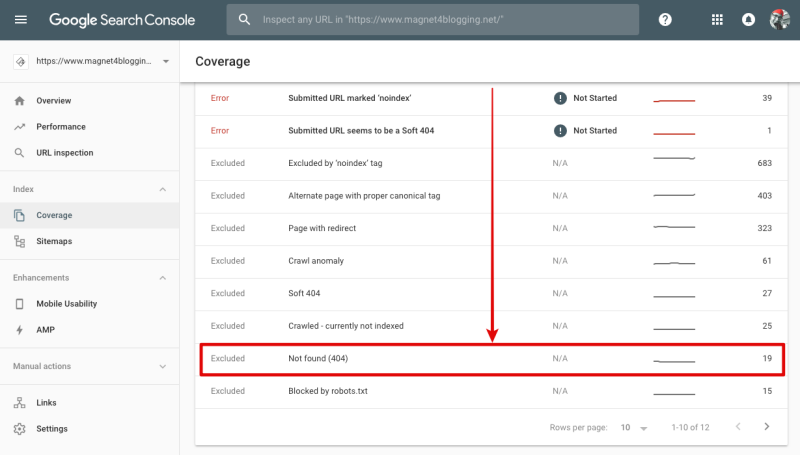 Personally, I do not know, however, there is an interesting post over on the Moz Blogabout 404 pages and SEO. It’s quite detailed and you should check it out when you get some time. Regardless whether 404’s are good or bad for SEO like I said to you, they can create a bad user experience on your site, and that my friends, Google does not like. 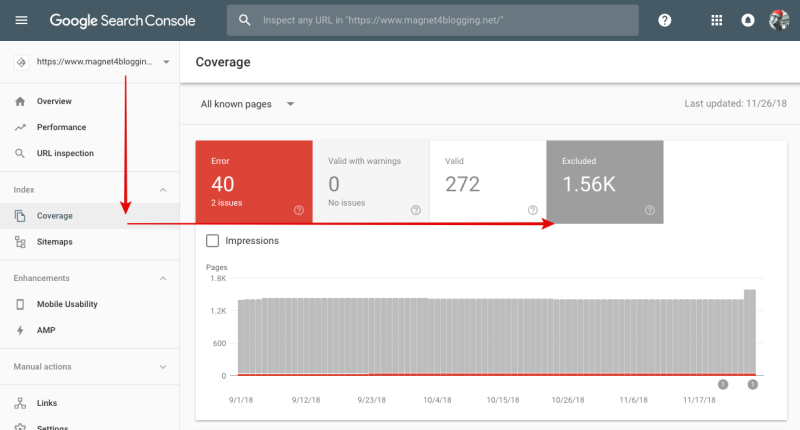 Google wants to see that you care about your website and it’s users, so it’s super-important that your content structure is top notch. 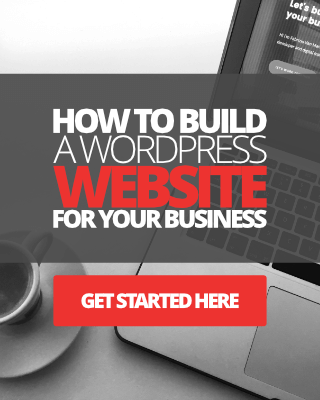 If your WordPress blog or website ‘is your business’, your breadwinner, then I don’t think you would want too many of your website users bouncing away because you have too many error pages on your site, right? Let’s fix your 404 error pages. One way to fix your error pages is to use 301 redirection. OK, let me explain really quickly. 301 Redirection is configured so that when someone visit’s a page that is no longer available on your website, they’ll be automatically redirected to another page. This could be another page on your website or blog post. The important thing to remember when using 301 redirections for deleted pages is to try and redirect users to a page that was similar to the deleted content. In other words, relevant. Sometimes this can be hard if you don’t have many blog posts to work with, however, but do your best. To make 301 redirections really easy for my website, I like to use a good old-fashioned plugin. Pretty Link – This is a fantastic plugin perfect for redirecting ugly links and making them no-follow such as affiliate links and long URL’s on your page that you want to shorten, etc. You can also use Pretty Link to redirect 404 generated pages. Redirection – The best plugin to use, by far, is the Redirection plugin. I use this very plugin to redirect all of my 404 error pages. This is the plugin that I’ll be showing you how to use to fix your 404 error pages below. 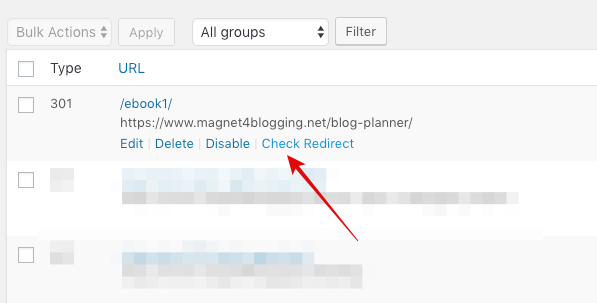 If you already have the Redirection plugin installed on your WordPress blog, you’re ready to rock-and-roll. If you haven’t got this installed yet, then download it and get it installed and activated! I’m going to assume that you have a Google Webmasters account, as all website owners should. So, open a new tab in your web browser and navigate sign into your Google Webmaster account. Then click on the respective domain name who’s 404 error pages you want to analyze and fix. Next, click on Coverage (Under Index Tab) > Excluded. See below. Then scroll down the page a little bit until you find Not Found (404). Click on this link to open up the Not Found (404) information page. See below. What you should now see is a list of all the pages within your domain that are returning as 404 error page not found. In the two images above you will see it says I have 19 affected pages. OK so next, click on any one of those URL’s in the list you see in your console and a new column will appear on the right-hand side of your screen. See below. What you want to actually do first is test the URL from the search console to validate that this URL is, in fact, returning a 404. See image below. When the page opens up in your browser and you see a 404, it’s time to fix it. In your WordPress site dashboard, navigate to Tools > Redirection. Click on the 404’s tab-link, as shown below. 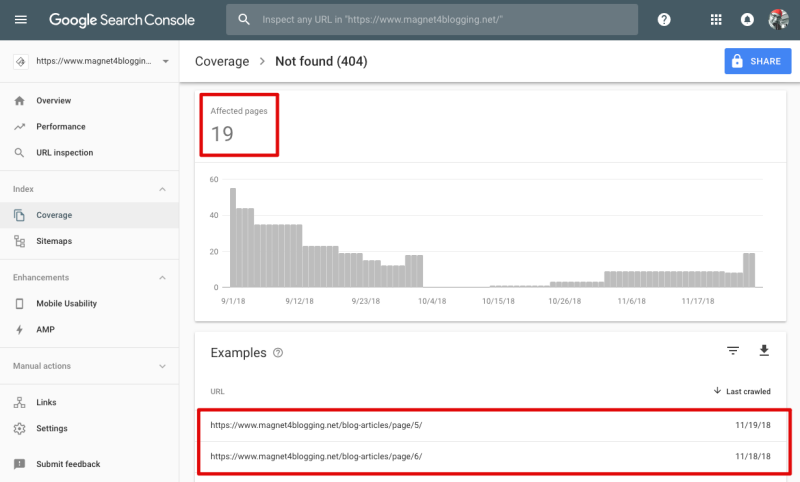 As you will notice from the screen grab above, the Source URL in the 404 logs is similar to the one in your Google Webmasters error page report. Since I already clicked on the URL /ebook1/ in my search console to validate it, it’s now appeared here in my log file in WordPress. 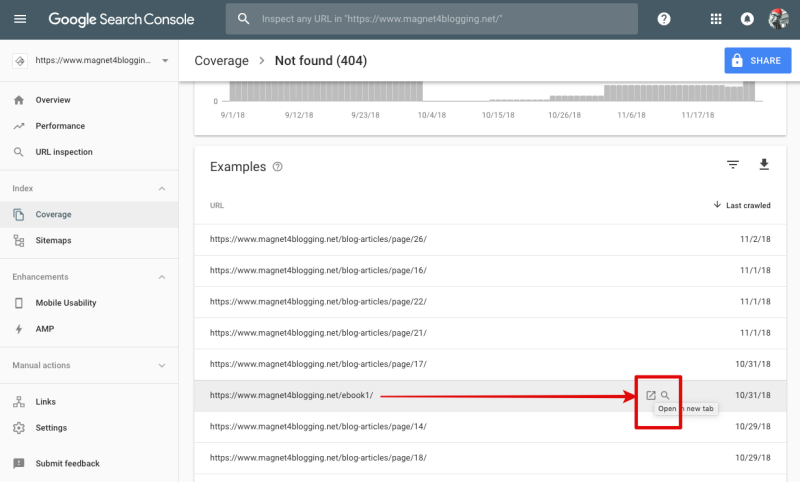 All the error 404 pages that you click on in your Search Console is recorded here in real-time in this plugin. 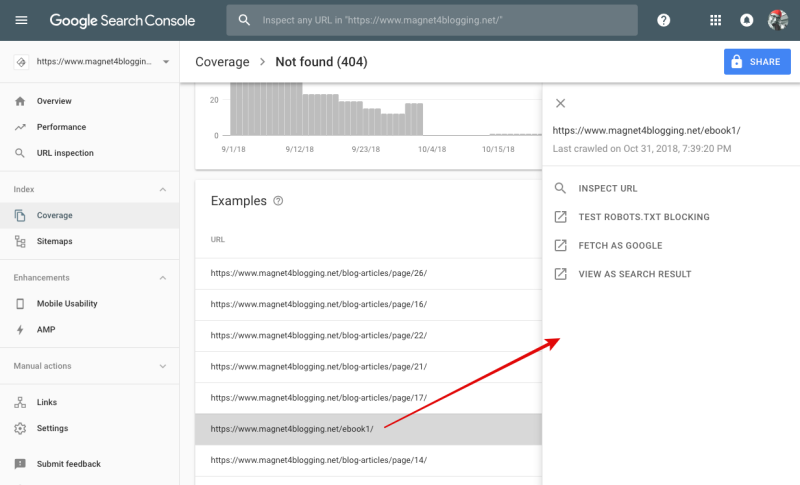 This is useful and saves a lot of time having to find and cross-reference 404 URLS between the Search Console and 301 Redirections plugin. Now, let’s fix this 404 error and redirect the old URL to another suitable active URL. Remaining in your WP dashboard, click on Redirects to add a new one. See image below. First, add the redundant URL into the Source URL box. Then add the active URL of the page you want the redundant URL to be redirected to into the Target URL box, then select Redirections from the group options and hit Add Redirection. See image below. You can view all the 301 redirections you create on the same page, Redirects. See image below. Here you can manage and see how many hits the URL is receiving, toggle, or move to another group or folder. Should you wish to delete a redirect in the future, perhaps because it’s no longer getting any hits or you no longer need it to be redirected, then you can do so with a single click. That’s pretty much it. That’s how you fix 404 error page not found on your WordPress website, all without losing your marbles. Of course, all we’ve done here is fix one single error. If you have many errors, then as you can imagine this process will take some time to do. However, it’s worth the time if you’re serious about creating a more user-friendly website. If you have any questions please don’t hesitate to get in touch with me. I’m always here to help.